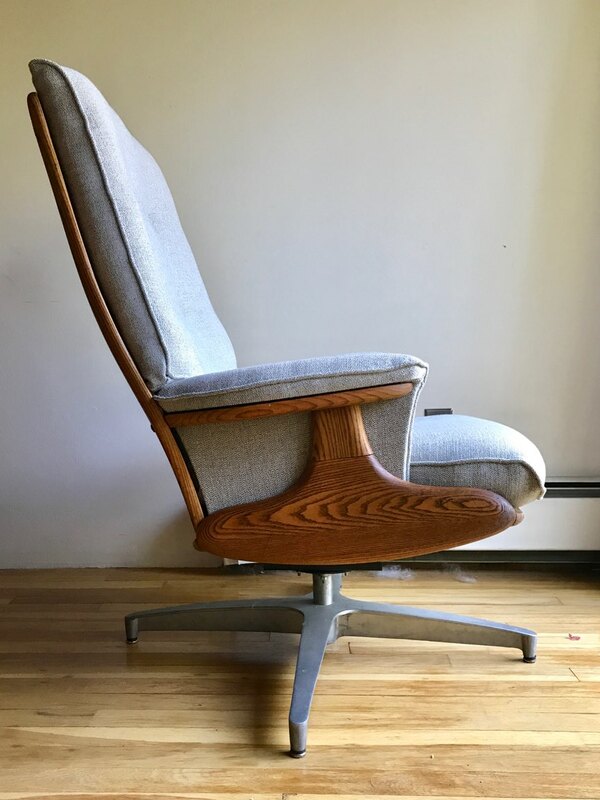 Haywood Wakefield lounge chair with ottoman. 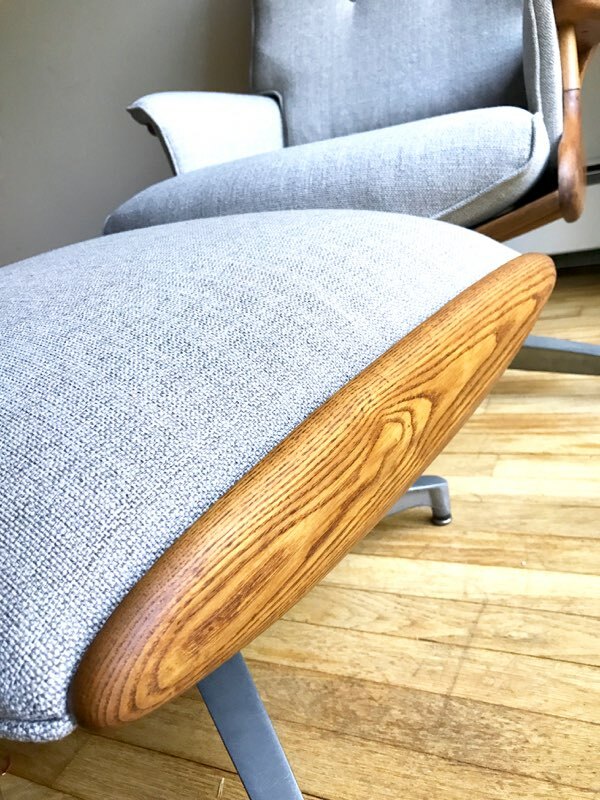 Free from old vinyl, new warm and soft upholstery compliments the teak wood grains. Daybed sofa reupholstered and refreshed with new caning on arms and new firm foam for comfortable sleeping guests! Ottomans! Custom ottomans that coordinate with our pillows. Same gorgeous fabrics that work well with our upholstered furniture. Danish Teak Loveseat upholstered in a soft heather grey felt wool with complimentary Pendleton accent pillows ties it all together! Vintage mod loveseat reupholstered in new blue/grey woven tweed. Seats sit on platform with patina brass trim. Custom bolster pillow for clients master bedroom bed. Custom bench for client's master bedroom. This 45" bench with walnut stained legs offers a nice spot to rest before tackling the day! Italian-made lounge in gorgeous blond wood reupholstered in warn grey felt wool. Fits right in! Family armchair lightly sanded and oiled, fresh new foam and fabric - ready for another decade. Custom window seat cushion in grey weave. Thats 161 inches of comfort! Plycraft with ottoman with fresh foam and upholstered in felted wool - this completed a beautiful master bedroom remodel for a good friend. Dux armchair reupholstered in Camira wool for a client. Pair of contemporary chairs with fresh teal woven fabric and refinished wood arms completed for a client. Modern loveseat with stainless steel frame newly upholstered in wool felt in Silcoates by Camira. Completed for client with custom dog cover - this is one gorgeous dog bed!